We decided to break our drive to the Hudson Valley Ribfest up over two days this year. Our overnight stop was in Bloomsburg, PA, about 2/3 of the way to New Paltz. 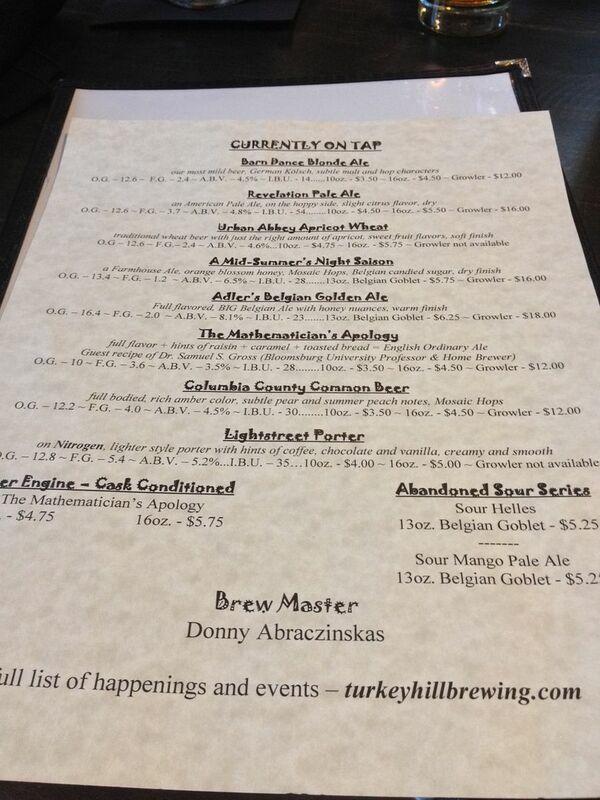 After checking into our hotel, we inquired about the brewery we saw on the corner, the Turkey Hill Brewing Co. The lady behind the counter said we couldn't go wrong with that choice. So, we made a short ten minute walk over to the brewery for some suds and dinner. The brewery is modeled after an old style country inn. It is warm and inviting with a nice pub like feel. After being seated, we scanned the tap list for a nice draft to quench our thirst. I must say, the brewery has a nice variety of beers on tap. I chose The Mathmematician's Apology and Hope settled for a Barn Dance Blonde Ale. Both drafts were outstanding choices. Mine was a full bodied English Style Ale with a rich caramel flavor. It starts strong and finishes crisp. Surprisingly light considering the dark color. Hope's blonde ale was light and refreshing. A very nice summer ale. While we were enjoying our first drafts, we could not help but to see the plates being delivered to the tables around us. Everything we saw looked outstanding. After some hard decisions, we placed our order. 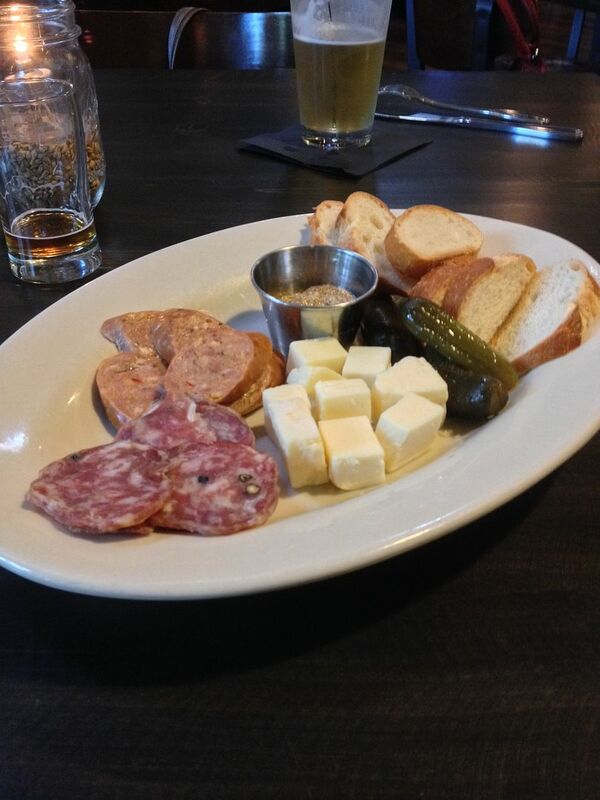 First off, we chose the Charcuterie Plate for an appetizer. Sharp white cheddar, homemade sopressata, sausage, sweet gherkins, crusty bread, and horseradish mustard strong enough to take the varnish off of a cabinet. It was a great start and a sneak peak at what was to come. Hope ordered the Flat Iron Steak. The steak was marinated with Stout, molasses, worchestershire, soy sauce, brown sugar and roasted garlic, and served with wild mushroom brown sauce with mashed Yukon Gold potatoes and steamed broccoli on the side. Hope ordered with out the mushroom sauce, but it didn't matter. Hope knows her beef and she stated that this was the best cooked steak she has ever eaten outside of a steakhouse. It was cooked to a perfect rare with just the right amount of caramelization on the outside. The potatoes were light and creamy. 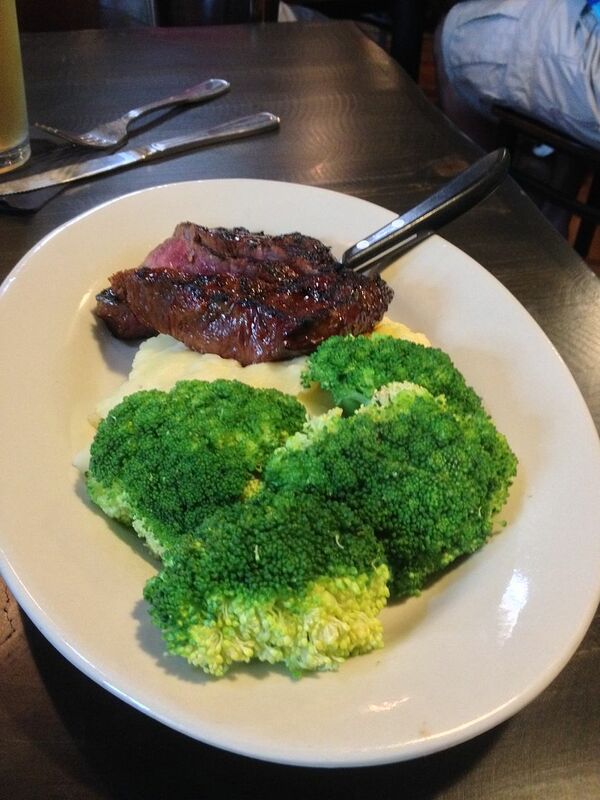 The broccoli was steaming perfectly with just the right amount of crunch. 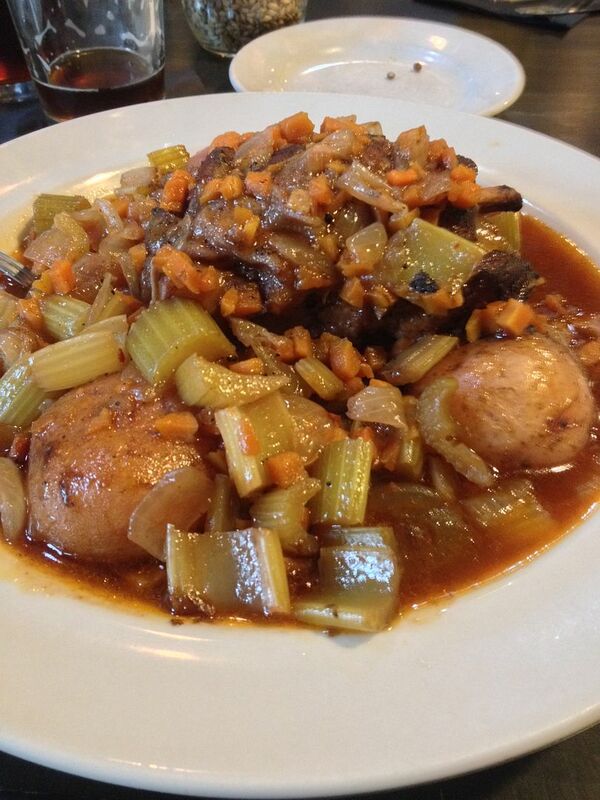 I ordered the Braised Pork Shank. It is a one pound pork shank, braised with root vegetables, stock, demi-glace, bloody mary mix and red wine served with roasted red potatoes. Outstanding. Every bite. The pork was fall off the bone tender and the root vegetables were not mushy at all. The only thing that would make this better would be to remove the potatoes and serve on some polenta or some garlic mashed potatoes. I will be trying to recreate both dishes here at home. We loved the place so much, we stopped for dinner on the way home. After being around BBQ and smoke all weekend, the last thing you want is something grilled or smoked. What is the perfect meal? 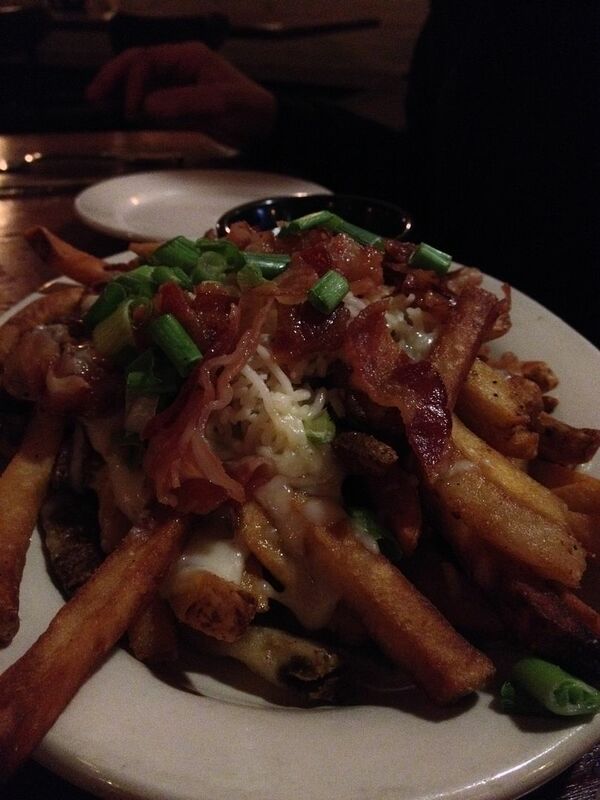 These bacon cheese fries hit the spot. The menu is diverse and everything we tried was top notch. The beers were excellent as well. If you are driving through Bloomsburg on I-80 looking for a place to stop, we would definitely recommend stopping here for something to eat and a frosty pint. Overall grade, A+. Labels: Bloomsburg, Turkey Hill Brewing Co.